Dr. Damani Philips is a native of Pontiac, MI, where he began playing saxophone at the age of 10. He currently serves as associate professor of jazz Studies and African-American studies at the University of Iowa, where he teaches applied jazz saxophone, directs jazz combos and teaches courses in African-American music, African-American Culture, jazz education and improvisation. 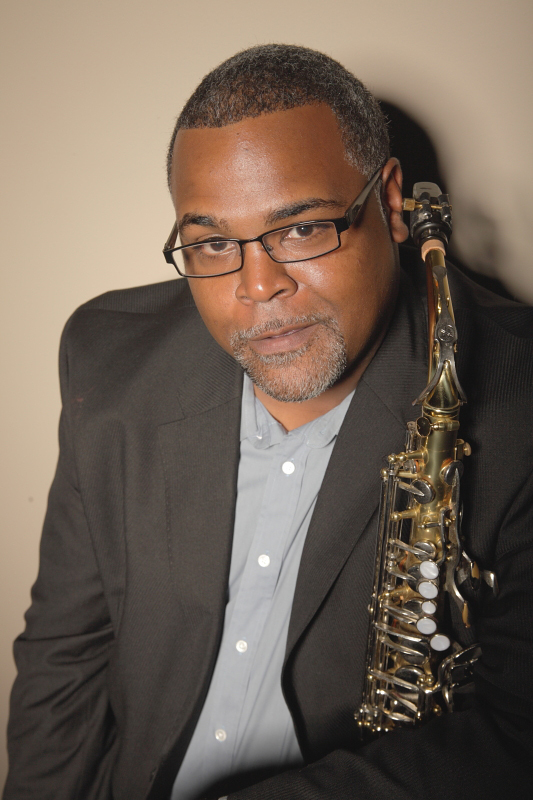 He earned Bachelor and Master of Music degrees from DePaul University (Chicago) and The University of Kentucky in classical saxophone; and a second Master of Music degree in jazz studies from Wayne State University (Detroit). Phillips completed the Doctor of Musical Arts degree in jazz studies at the University of Colorado at Boulder in 2009; becoming one of the first African-Americans in the country to do so. An active performer, pedagogue and composer, Phillips has taught and performed throughout the United States, Europe, Africa and Asia. He previously served on the full time faculty of Grinnell College, the adjunct faculty of Oakland University (Rochester, MI) and Macomb Community College (Macomb, MI), and is actively sought as a guest artist, clinician, lecturer, panelist and adjudicator throughout the country. As a performer, Phillips has shared the stage with artists/groups such as Lewis Nash, Christian McBride, Terrence Blanchard, Wycliffe Gordon, Bobby McFerrin, Marcus Belgrave, Terrell Stafford, Maceo Parker, Pat Bianchi, Ira Sullivan, The Temptations, Red Holloway, Greg Gisbert, and many others. As a recording artist, Phillips released his debut CD Yaktown Nights in 2003, The String Theory in November of 2010, and The Reckoning (featuring New York standouts Pat Bianchi - organ, Greg Gisbert – tpt and Lewis Nash - dr) in 2012. His latest recording project Duality (2015) is a double album featuring a unique synergy between straight-ahead jazz and hip hop music. Phillips is also an active academic scholar, with numerous research presentations at colleges, universities and scholarly forums both domestically and abroad to his credit. His research focuses specifically on addressing cultural concerns in the pedagogy of Black music within academia. Phillips recently published his first book titled “What is This Thing Called Soul: Conversations on Jazz and Black Culture”, which delves into the difficult topic of the decline of Black cultural influence/representation in jazz music as traditionally taught in academic spheres. This page was last updated on September 27, 2017 . Please contact us at music-webmaster@uiowa.edu if you need further information.